What happens when you combine a mouse pad with an LED strip? 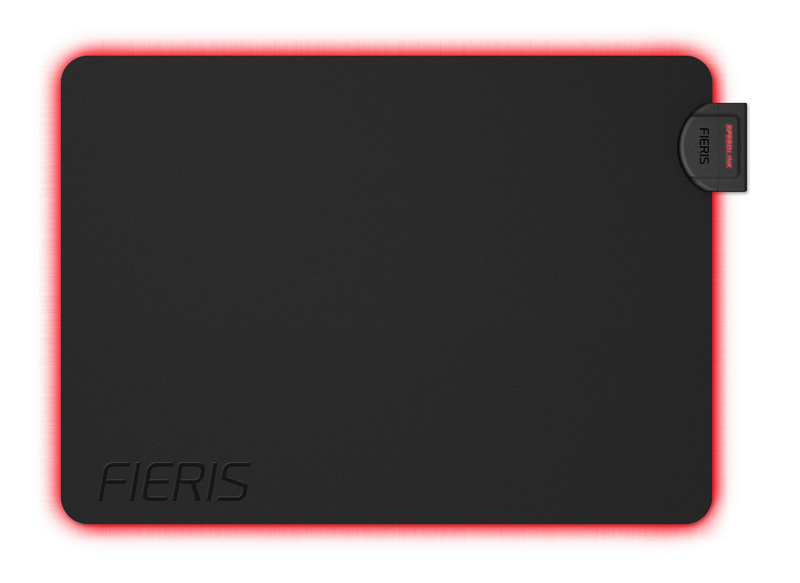 If you’re Speedlink, you get the Fieris illuminated mouse pad. It sounds a little silly, but it’s actually pretty cool — here’s our full review. This looks exactly like an ordinary black mousepad, except it has a nodule in the upper right corner. Plug in a Micro USB cable, and the perimeter of the mousepad (and the nodule’s Speedlink logo) is illuminated in red. The effect is noticeable without being distracting, and the mousepad’s edges aren’t any thicker than you would normally expect. We used the Speedlink Fieris for a few days to see how it performed. 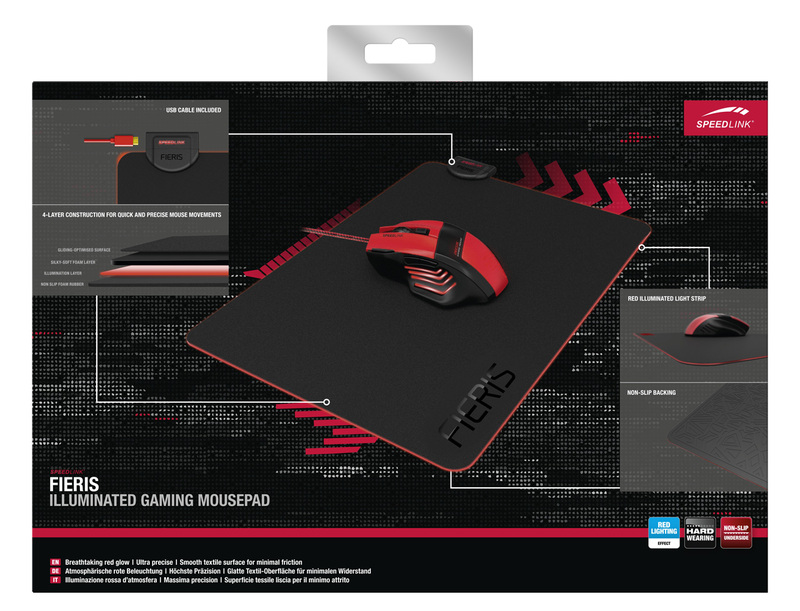 In terms of gaming, we found that the mouse pad was an adequate size for medium to high DPI gaming, although Counter-Strike and other low-DPI players may prefer a mousepad of greater dimensions. The surface was regular and smooth, offering a good balance between speed and control. Some players may prefer thicker mouse pads for greater comfort over long gaming sessions, but the 4 millimetres of thickness on the Fieris isn’t a cause for concern. The only real drawback we discovered was the power source. The micro USB cable takes up a USB port on your PC, and requires careful routing to ensure that it doesn’t get in the way of your mouse or mouse cable. There’s no software available to change the brightness, and your only colour option is red. However, red is probably the most common accent colour in gaming circles and matches other Speedlink products, so it’s a sensible choice. 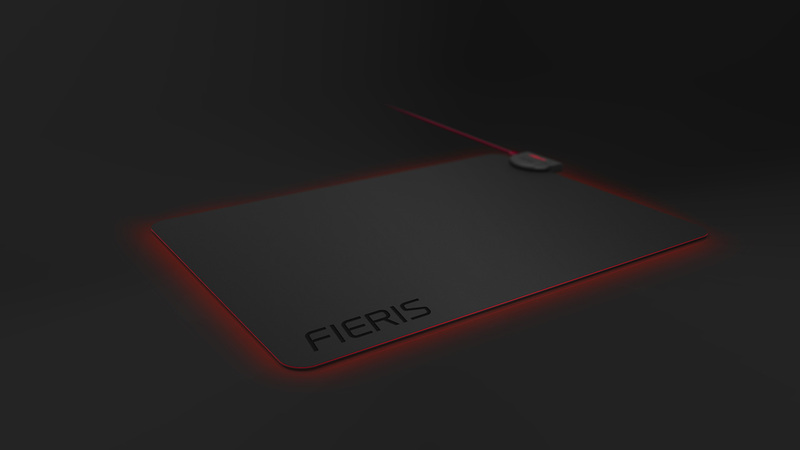 Overall, the Fieris is a nice mouse pad that boasts a nice medium-size mousing surface with an eye-catching look. For its £26 / €26 asking price, that seems fair enough. If you’ve got a spare USB port and you want something a little more fun than the average mouse pad, give it a try. You can find the Speedlink Fieris for sale via the links below.